The Darkside is coming home. Third Battalion, 4th Marines, will return to their base at Twentynine Palms, Calif., next week following a trying seven-month deployment in Afghanistan. The unit saw heavy combat while patrolling The Upper Gereshk Valley and Nahr-e Saraj district, an area of northern Helmand province just south of volatile Sangin district. Five* members of the battalion died and dozens more were wounded during the deployment, Marine officials said in a news release announcing the unit’s return to California. They handed over control of the area to a joint Afghan-British force headed by 42 Commando, a Royal Marine unit, a move Marine Corps Times forecasted in this story. It’s one of the first parts of a U.S. drawdown in Afghanistan that will reduce the amount of Marines in Helmand and neighboring Nimroz provinces from about 20,000 service members this summer to 18,000 by the end of the year. 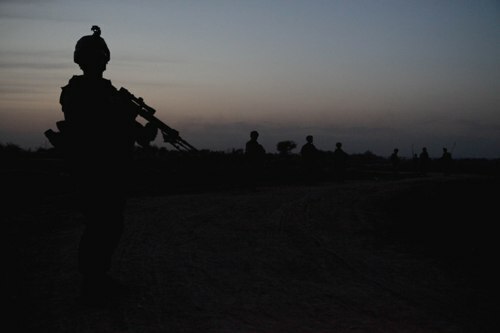 An additional 4,000 to 6,000 Marines could be slashed in Afghanistan by the end of 2012, Maj. Gen. John Toolan, the top commander there, told Marine Corps Times last month. The BBC embedded with 3/4 this summer, publishing reports like this one that made it clear their area of operations had its fair share of danger. A memorial service will be held at Twentynine Palms on Oct. 27 to honor 3/4’s fallen Marines. *UPDATE: Using information provided by the Marine Corps, this blog entry initially reported that three Marines with 3/4 died during the unit’s deployment. The correct number is five. This blog entry was revised to reflect the correction. Welcome Home Marines!!! I too think they need to reassess the situation in the mid-east. You have no win condition against a thousand years of tribalism. War is a condition they can out last you in. No meaningful objectives to be gained there. All we do is surround Iran… …for Israel and Saudi Arabia. We need you home; No more war… Someone needs to stop this. It’s nonsence. SSGT Leon H. Lucas, Jr. I hasten to add that CPL Paul W. Zanowick II died first. I believe the order is correct otherwise. Thanks for pointing out the error on the casualties. The Marine Corps provided that information in a news release. I’ve updated the entry to reflect the correction. The best way we can help our troops in places like AfPak is to get out of there asap. No one knows what we were or are trying to accomplish over there. Lives piddled away on an almost daily basis for no good reason. I feel no safer today because of AfPak operations than on 9/11. Quit wasting American lives. Thank you for the immediate correction. Regardless of the draw down, our Marines are accomplishing more than the mainstream media and left wing peaceniks know. We ARE safer today because of the work, untiring sacrifice and sheer fire power of our Marines. @TominTX You,sir are a fool.And the fact you use terms like AfPak doesn’t make you any smarter either.We never were in Pakistan.The place we’re at is called Afghanistan.And if you yourself don’t know,don’t presume that,as you say,no one knows what we were,or are trying to accomplish over there.You may not feel safer,but non the less you are.So quit whining and being a smart a** and show some respect to mothers who lost their sons! My brother returned to the US with 3/4 today, on my 28th birthday, and I thank God for such a blessing, but I know that too many mothers, fathers, brothers, sisters, and children saw the return of the unit without their loved ones. My deepest, sincerest sympathies to those who have lost because you are the ones who know what price was paid for freedom. I pray that God will comfort you in your mourning and that you will find His peace above all. Welcome Home Son! We missed you and are glad you’re back on US Soil! Welcome Home Marines. Always keep track of my old junior guys. glad to hear yall are home. former marine of 3/8 marine i. co 2nd plt . some of you guys relieved us. I know it wasn’t easy, i thought about yall a lot. Nobody is waisting their LIFE. It’s a sacrafice a life made so that another can be FREE and SAFE. we gladly put our lifes on the line to know that their is a possibility it could keep someone here in america safe, and maybe it doesn’t, but were all willing to make that sacrifice just in case. Sadly no one still doesn’t get the big reason which is your buddy, your brother, your boy, your friend, the guy to your left, the guy to your right! To everyone in 3/4 and the families you all are heroes. everyone in 3/4 and the families went through a lot. You all are heroes. Welcome home Son, Semper Fi to ALL.